The main reason your carpets may start to appear dirty or re-soil easily soon after cleaning by the budget carpet cleaners is the cleaning agents - harsh chemicals, oily solvents, and sticky detergents - which they apply and do not fully extract from your carpet. These unwanted, leftover cleaning agents begin to attract dirt and soil almost immediately after the carpet has dried. Why do these companies use harsh chemicals? Because they have to compensate for lower water temperatures in order to remove soils and stains and give a "clean" appearance. These chemicals leave an invisible sticky residue in your carpet. Also, most cleaners leave your carpet in a highly alkaline state which also attracts soil and feels "crunchy" instead of "fluffy". These companies have little incentive to "clean up their act" because residual chemicals that cause carpets to re-soil quickly just mean more frequent calls for cleaning service, since most homeowners are not aware of the cause of this problem. Click here for 10 Questions to Ask your Carpet Cleaning Company Before You Hire Them so you can be sure your carpets will be cleaned properly. Green Planet Carpet Care is the best carpet cleaning service in the Phoenix Arizona metro area. We have solved the common problems associated with carpet cleaning in an environmentally friendly way. Our carpet cleaners do not use any detergents in our hot water extraction system. Our carpet cleaners only use eco-friendly mild active enzyme and citrus-based green products in our pre-spray. Also with our carpet cleaning service, your carpets will usually dry in half the normal time because of the powerful vacuum suction of our Vortex 7000 cleaning machine— it simply removes virtually all of the hot water applied in the rinse/extraction step of the cleaning process. Click Here to Find Out How We Professionally Clean Your Carpets. 2. The temperature of the water is paramount! Our Vortex cleaning machine delivers steaming hot water to your carpet at temperatures up to 260 degrees F. And the temperature of the cleaning water is critically important to the cleaning power: Did you know that the cleaning power of hot water increases by 100% for every 18 degrees above 118 degrees F? This means that our system at 260 degrees F cleans four times better than any van-mounted system using water at a temperature of 180 degrees F (Fahrenheit). 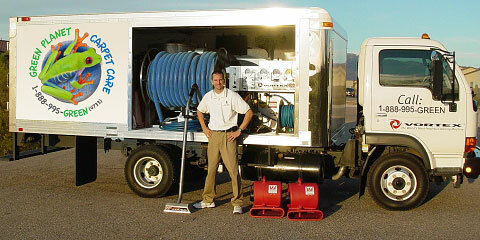 Most cleaning companies using van-mounted equipment are not able (or willing) to deliver those temperatures because their machines frequently overheat and shut-down, causing them to waste time running back and forth to reset the equipment. Usually they just lower the temperature on purpose— which also insures they won't be sweating in a hot van on the way to their next job. The water in our cleaning machine is heated by the truck's diesel engine using a patented Xantherm heat exchanger process and is located in a physically separate compartment of our truck. That means we can run the absolute hottest temperatures all day long and still drive to our next job in the cool comfort of an air-conditioned cab! 3. Powerful truck-mounted system - You will never achieve the same cleaning results from a portable carpet cleaning system plugged into a 110 VAC outlet in your home. Although many "budget" carpet cleaners use portable steam cleaning machines, these systems are incapable of producing water hot enough and vacuum powerful enough to completely remove soils, stains and chemical residue. This is why a portable system costs less than $8,000 and our Vortex system costs more than 10 times as much.